Today’s #momentofchill is from Chase and Aimee of Tight Loops, and it features the incredible bison of Yellowstone National Park. Sound up for this one! The bison (Bison bison) of Yellowstone have inhabited the region continuously since prehistoric times. The Yellowstone herd is the nation’s largest on public land, and their genetics have remained pure, as they have been kept from interbreeding with cattle. 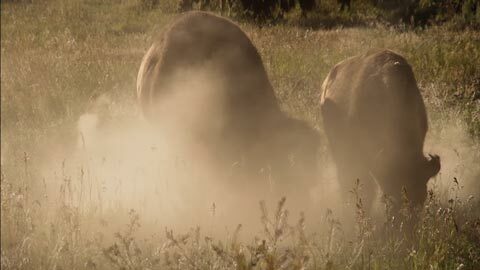 Because these bison are allowed to roam freely across such a vast expanse–inside and outside the park–they behave like their ancient ancestors, as if man had not almost wiped them out. By 1889, there were just 1,091 bison left on the planet, but today, there are about a half million. That’s still a small fraction of the estimated 20 to 30 million that once roamed the Great Plains.